I've been knitting this sweater for the past few weeks. I really love the pattern, but I'm realising this wool is all wrong for it. I got to the bottom if the sweater just before Christmas, tried it on, and decided I hate it. The pattern is called Narragansett, by Thea Colman. Hers is really pretty! We were in Adelaide for about two weeks over Christmas (such a good holiday!) 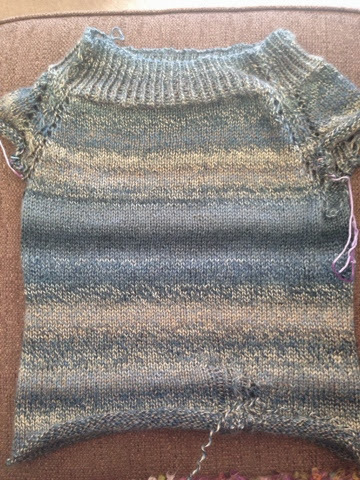 I had planned on taking my knitting, but I was so frustrated with this almost-complete sweater that I put knitting out of my mind for two weeks. I can't seem to make anything that I actually like! The first problem is that it's a bit loose around the top, then goes tight over my rotund middle bit. (Too many McDonald's cheeseburgers.) What with those horizontal color stripes, it is NOT a flattering look! 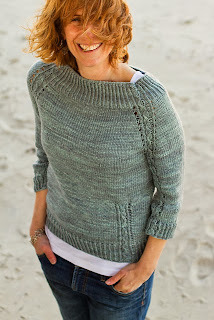 So do I forget about the pretty Narragansett pattern and try to knit a looser fitting sweater? The pattern doesn't really work with this wool anyway. Do I turn it into a cardigan? Do I finish it and gift it to someone I don't like very much? Or do I rip it up and donate the wool to the Salvation Army so I never have to think about it again?